This leafy green vegetable has been a part of people’s diets for a very long time. It belongs to the family Amaranthaceae-Chenopodiaceae, and has the scientific name of Spinacia oleracea. There are three types of spinach typically available: Savoy (crisp, creased curly leaves), smooth-leaf (flat, unwrinkled, spade-shaped leaves), and semi-savoy (similar in texture to savoy but not as crinkled). All of these variations are low in calories and loaded with vitamins and minerals, that are hard to find in other foods. A cool climate is best for producing spinach. During periods of warm temperatures and long days, plants are likely to produce seed stalks before making desirable foliage growth. Spinach is fast growing and short-lived and matures its leafy foliage in 7 weeks. Spinach then quickly goes to seed, although it produces for a longer period in the cool, coastal areas before seed stalk development occurs. When ready to harvest, you can either cut the entire plant or just remove the outer leaves. If you carefully cut the plant above the growing point, you can then obtain a second crop. There are a plethora of benefits gained by eating spinach. Just one cup of spinach has almost 20% of the RDA of dietary fiber. Dietary fibers are important because they aid in digestion, prevent constipation, help sustain low blood sugar, and suppresses overeating. Also, in just one cup, there is over 337% of the RDA of Vitamin A. Vitamin A is vital for the body because it strengthens mucous membranes, respiratory, urinary, and intestinal tracts as well as fight off infections (as a key component of white blood cells). Vitamin A also helps to retain moisture on the skin, which will fight wrinkles, acne, psoriasis, and keratinization. Spinach also contains a lot of flavonoids, a phytonutrient that slows down the division of cells in human stomachs and skin cancer cells. Also, spinach has been shown to help protect against aggressive prostate cancer, what is considered Stage III or IV prostate cancer with a Gleason score of at least 7. Two anti-inflammatory epoxyxanthophylls, neoxanthin and violaxanthin, are found in spinach. These two carotenoids will regulate inflammation. Also, gycoglycerolipids, the main fat-related molecule in the membranes of light-sensitive organs in most plants, can help protect the lining of the digestive tract from unwanted inflammation. Powerful antioxidants, such as Vitamin C, Vitamin E, beta-carotene, manganese, zinc, and selenium, are also found in spinach. Antioxidants help against the onset of osteoporosis, atherosclerosis and high blood pressure. It has been studied that the more bright, vibrant-looking spinach leaves contain the most amount of Vitamin C. The carotenoids with antioxidant properties, lutein and zeaxanthin, are also found in spinach. These carotenoids protect the eyes from cataracts and age-related macular degeneration, which is the number one cause of blindness for those over the age of 55. Spinach has also been shown to lower blood pressure because of a peptide found in spinach. This peptide inhibits the angiotensin I-converting enzyme which as a result, will lower blood pressure. If eaten in large quantities, spinach may have some side effects. Spinach is high in oxalic acid which is a chemical that binds with iron and calcium and causes the body to absorb less of these nutrients. Also, for those who are prone to kidney stones, it is advised to avoid spinach because it contains purines, an organic compound that the body turns to uric acid. High levels of uric acid will increase the risk of developing kidney stones. Since spinach is high in dietary fiber, which aids in digestion, eating too much can cause an upset stomach. One can experience gas, bloating and cramping, and possibly diarrhea. O’Brien, Maria. “Facts on the Health Benefits of Spinach.” Livestrong, 04/26/11. Web. 3 June 2013. Rivers, Dacia. “Side Effects of Spinach” Livestrong, 03/30/11. Web. 3 June 2013. “Spinach.” Whfoods, n.d. Web. 3 June 2013. “Spinach.” Howstuffworks, n.d. Web. 3 June 2013. “Spinach.” Purematters, n.d. Web. 3 June 2013. 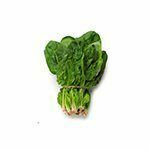 “Spinach Nutrition Facts-Health Benefits of Spinach.” N.p., n.d., Web. 3 June 2013.